Castello di Vicarello is a family home, if your parents happen to be glamorous Italians who’ve turned a 12th-century castle into a luxury hotel. F&W’s Pamela Kaufman checks in. I am a worrywart traveler. I fret too much about misplacing my passport, missing my train, hearing myself say “Good morning,” in French, when I’m trying for “Good night,” in Spanish. I often feel torn between the urge to have my own adventure and the desire to let someone else take charge and save me from my own neurotic ridiculousness. So when I got the chance to go to Tuscany to stay at a 12th-century castle in the coastal region of Maremma, transformed into a luxurious hotel by a couple who would watch over me for a few days, I said yes right away. Not only have Carlo and Aurora Baccheschi Berti renovated the time-ravaged buildings of Castello di Vicarello themselves, a project that took 10 years and almost as many contractors, but they raised three sons there. Vicarello is their hotel, but it is also their home, and their presence enhances everything else that’s lovely about the place: the medieval stone walls surrounded by rosemary, lavender and rose bushes; the yoga classes at the spa pavilion beside one of the two infinity pools, taught by an instructor who promises to lead guests into a state of complete relaxation (I mentally dare him to attempt that on me); and the estate’s acres of olive groves, gardens and vineyards. Vicarello’s seclusion encourages some visitors to linger, doing very little, and others to venture out to explore the Etruscan towns nearby or drive to the sea, 25 miles away. Castello di Vicarello’s luxurious interior. Photo © Sally Gall. Vicarello’s vineyards are the first thing I see when my taxi driver finishes our steep ascent through the cypress-covered mountains and along the final stretch of unpaved road. The castle, its walls honey-colored in the late-afternoon sunlight, rises above. I walk up the steps and under an arch. Aurora—a small, slim woman with an aristocratic silver bob and a lovely way of tilting her head back when she laughs—greets me in the small courtyard, where guests can have meals under a vine-covered pergola when the weather is mild (there is also a glass-walled dining area off the kitchen). Then she deposits me and my luggage in the Sprone suite. Like all of Vicarello’s seven guest rooms, this suite has the weight of antiquity, with heavy stone walls and floors and a timbered ceiling. It is furnished with the Bertis’ finds from Bali, where they lived for close to 20 years: wooden furniture, carved figurines. Surrounded by so many things that reflect the couple’s personal history, I feel a connection that I rarely do in a luxurious hotel. I check out the big claw-foot tub set next to a low, arrow-slit window through which a bather can look out at a transcendent mountain vista. I imagine myself in that tub. I start to relax. Lunch in the Castello di Vicarello courtyard. Photo © Sally Gall. But first I need to eat. I head back out to the courtyard, where Carlo is smoking a cigar and chatting with a couple from Toronto about his new Samsung Galaxy smartphone and the superiority of black truffles over white. He and Aurora live upstairs, so he is often at this table, holding court, sometimes answering questions about the wines he makes—a Sangiovese blend called Terre di Vico, a Brunello di Montalcino Riserva and a Cabernet blend called Castello di Vicarello. They are gaining serious acclaim in Italy and appearing on the lists of high-end American restaurants, like the Four Seasons in New York City. One of the staffers brings me a lunch menu. I select smoked swordfish. “Have the pasta, you are in Italy!” Carlo genially bullies me. My own mild-mannered, non-foodie father would never correct my order at a restaurant. I came to Vicarello looking for someone else to take charge of my travel experience, but could being temporarily adopted by a hyper-opinionated Italian have its downside? Aurora oversees the action around Vicarello’s huge 1957 Triplex stove. 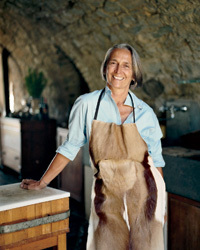 The author of My Tuscan Kitchen, published by Rizzoli last spring, she gives cooking classes in the vaulted kitchen that’s another of Vicarello’s hangout spots. She’s an inspiring teacher, in part because her recipes are minimalist, but mainly because she is so matter-of-fact. “I am not a chef; I am a cook for good everyday food,” she tells me. I’m delighted to be mentored by someone so at ease in the kitchen, unlike my actual mother (who is nurturing in many other ways, I hasten to add). Castello di Vicarello’s vaulted kitchen. Photo © Sally Gall. We begin by making dough in a food processor: flour, chopped chives, dried oregano “and some parsley that is arriving,” Aurora says as her kitchen assistant walks in from the garden with a fragrant green bundle. “I don’t wash it,” she says, smiling. “It is from the garden; it is clean.” She adds a bit of water and zhoozhes everything in the machine. It produces a soft, green-specked round of dough. We roll it out and drape it over a tart mold; she cuts off the excess with scissors. What to do with the extra? “Let’s make chapati!” she suggests cheerfully, heating rounds of dough in a pan so they resemble Indian flatbreads. “Now we do the inside of the tart,” she says. First we will “put together fresh herbs that go together in your fantasy.” She heats oil in a giant pan, then adds lettuce leaves, those herbs, sea salt and a garlic clove, and lets everything cook down. “It’s simple, no?” When the lettuce is soft, she spoons it into the tart crust, lays a few anchovies on top and slides it into the oven. Is this the kind of food she used to make for her sons when they were growing up? “My oldest son was very picky about vegetables,” Aurora replies, shaking her head. I’m secretly a little doubtful that I’m going to love cooked lettuce. But when I try the tart, the filling is so delicious and succulent, and the anchovies are so delectably salty and crunchy, that I devour my slice along with a glass of Terre di Vico. The road to Castello di Vicarello climbs through cypress-covered mountains. Photo © Sally Gall. Still, the highlight of my stay at Vicarello isn’t at the castle, nor is it in the beautiful but touristy town of Montalcino, where Aurora drives me in her Range Rover on a Brunello di Montalcino pilgrimage. 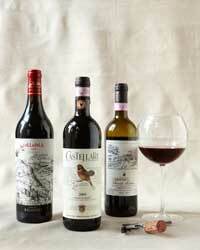 Instead, I have my best experience at Vicarello’s wild-boar-hunting reserve—Carlo’s most recent obsession. Hunting is often a moral issue in America, but to the Bertis, it’s simply a traditional way to procure food. Having eaten my fill of Vicarello’s wild-boar sausage, I’m curious to see where it originates. Not that I’m looking to do any hunting. “When you see a boar, you have three seconds to shoot it. It is very fast,” Carlo tells me, as if my lack of speed and not my utter unfamiliarity with firearms is the problem. Aurora drives us to the reserve, which is near the Etruscan mountain town of Buriano. There, in a grassy field surrounded by boar-filled forest, live the Bertis’ Maremmana cows—massive white animals with fearsome horns. I’d already seen their pictures: Carlo had shown me a photo of one on his phone, displaying it with as much pride as if it were a grandchild. “Che bello,” Aurora coos. We pull up to a hut where hunters have their meals. One of the reserve’s gamekeepers, Moreno, awaits us. “He is a gourmet,” Aurora says respectfully. In a grilling pit outside, he has already prepared a wood fire. Aurora hands him some of the meat we bought at a shop along the way—chicken (head and feet removed by the butcher at Aurora’s request), sausage, pork belly, pork ribs, plus a zucchini and a tomato from her gardens. 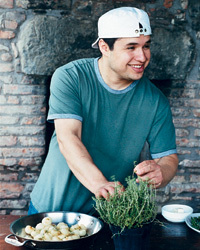 Moreno slices the vegetables right on the table, squeezes everything into grilling baskets, seasons the food with olive oil and sea salt and positions the baskets over the flames. Later, as we drive around the reserve, Aurora explains the series of gates that control the boars’ movements and points out the platforms where the hunters await their prey. We see some baby boars and a magnificent stag, which scamper away. But the high point of the day, and the trip, is when Aurora and I eat Moreno’s food with our hands, zucchini juices dripping. I might never be a real daughter of Tuscany, but I feel happy—relaxed and happy—to pretend to be one in that moment. Castello di Vicarello co-owner Carlo Baccheschi Berti. Photo © Sally Gall. Visitors to Castello di Vicarello can hang out with co-owner Carlo Baccheschi Berti, who makes three Vicarello wines that are gaining recognition in Italy and the US. Summer visitors make good use of Castello di Vicarello’s infinity pools. Photo © Sally Gall. Most travelers visit Tuscany in the summer, when Castello di Vicarello’s two infinity pools get serious use; fall and spring are beautiful too. From $546 per night; vicarello.it.